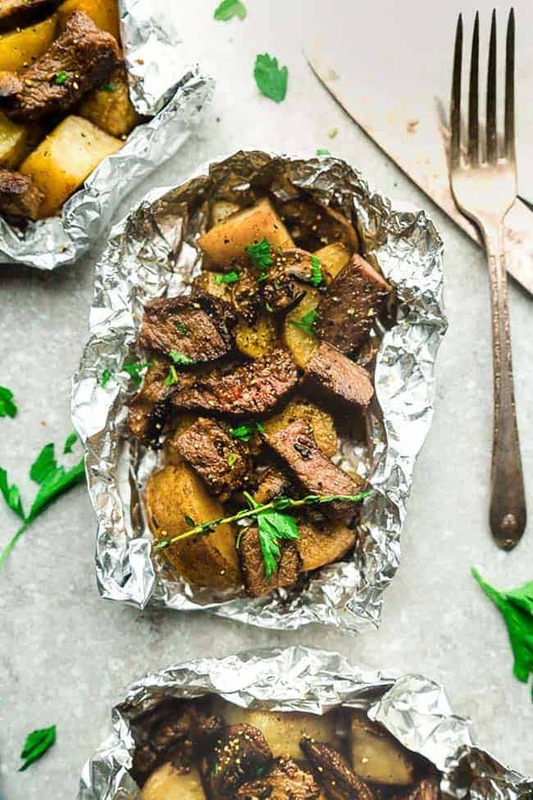 Steak and Potatoes Foil Packets are full of flavor with mushrooms, garlic, butter, herbs and perfect for busy weeknights. Best of all, instructions for the oven and the grill. Grilling season is in full effect and I could not be more EXCITED! We love love love hanging out on our patio during the spring and summer and nothing beats an easy and flavor packed foil packet dinner. Foil pack meals are ALL the rage right now. They are just so darn simple to put together with practically no clean up. The last thing most of us want is to be stuck indoors when it’s nice outside. 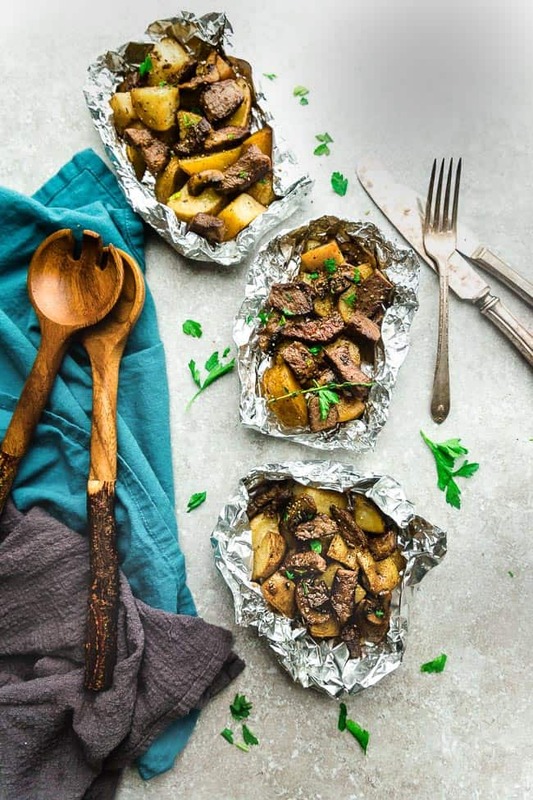 This recipe for Steak and Potato Foil Packets is the perfect easy and delicious dinner recipe to have in your back pocket for summer or your next camping trip. My husband is a big steak and potatoes guy and is always on board when steak and potato foil packets are on the dinner menu. A few of our other favorite foil packet meals include: Chicken Fajita Foil Packets , Teriyaki Beef Foil Packets and Barbecue Chicken Foil Packets. And although they are tasty all year round, foil packet meals are the best on a hot summer day when you can leave the oven off and toss them on the barbecue in the backyard. 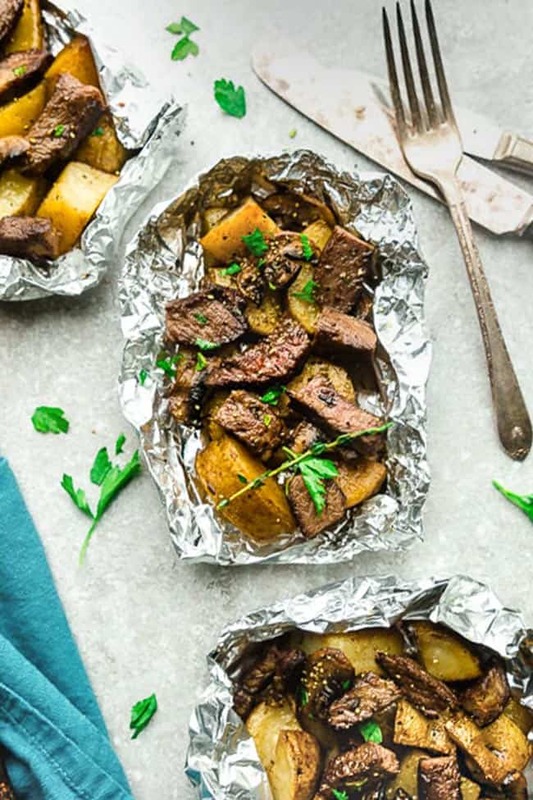 Like I mentioned above, these Steak and Potato Foil Packets is especially perfect for the meat and potatoes lover in your family. 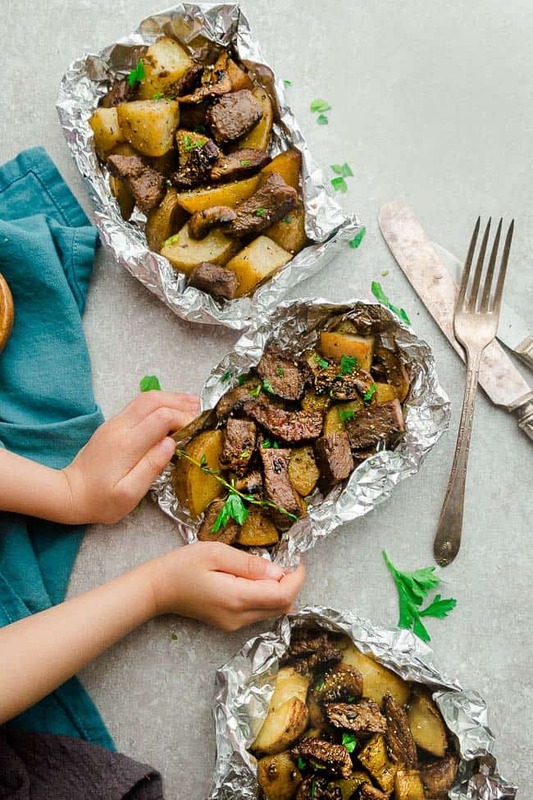 My husband and step-dad happen to fall into that category so these foil packets are definitely one of the recipes on the menu for Father’s Day. 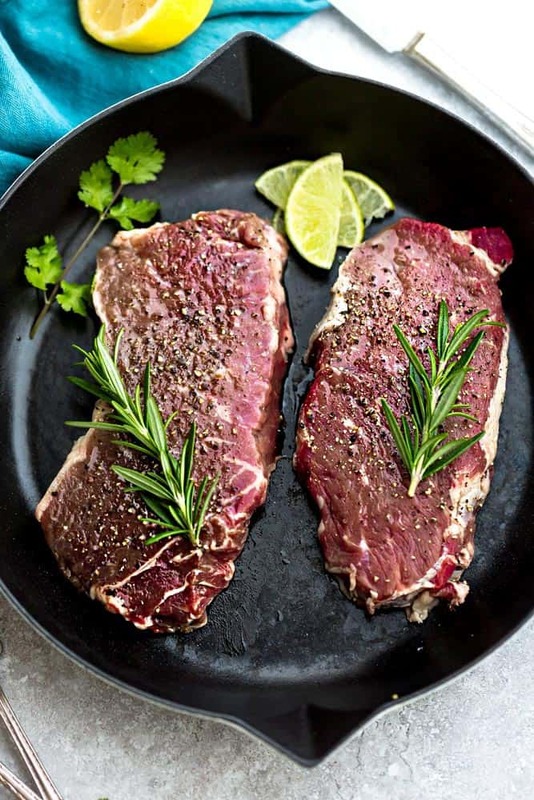 Combine the steak with mushrooms, onions and potatoes to a large bowl then toss with olive oil, melted butter, garlic powder, thyme and oregano. In order for the potatoes to cook evenly at the same time with the steak – be sure to cut them into chunks no larger than 1 inch chunks. I used russet potatoes but baby Yukon or baby red potatoes are also great. Cook on the grill with the lid closed for about 10 minutes, then flip the foil packets and cook for an additional 7-8 minutes. If you like a nice char on your steak, add them directly to the grill during the last few minutes. For a perfectly tender and juicy steak, it’s important to go for well-marbled cuts —that extra fat enhances flavor and promotes tenderness. CAN I MAKE FOIL PACKET DINNERS IN THE OVEN? Yes. 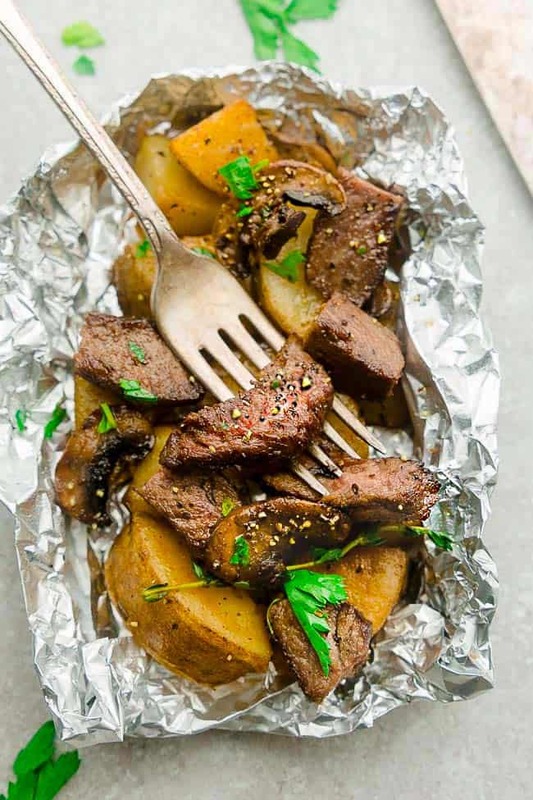 To make these steak and potato foil packets in the oven, just add the foil packets onto a baking sheet and cook for 18 minutes at 425 F.
In order to get a char on the steak, switch the setting to broil for and cook for an additional 2-3 minutes with the foil open. WHAT OTHER SIDES ARE GOOD WITH STEAK FOIL PACKET DINNERS? These steak foil packets would be delicious on their own but feel free to swap in any vegetables of your choice. For the mushrooms, I used cremini but you can also use button or portobello mushrooms if you have those on hand. And instead of Russet potatoes – sweet potatoes, baby potatoes or red potatoes would be delicious as well. I also like to customize each foil packet so whenever I make these for our family, I like to add some vegetables like red bell peppers, broccoli and corn for my kids. Slice and season the steak ahead of time and seal in a zip-top bag in the fridge. Combine the olive oil, melted butter, garlic powder and herbs together in a resealable jar until everything else is ready to go. 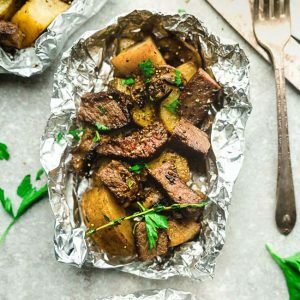 Steak and Potatoes Foil Packets are full of flavor with mushrooms, garlic, butter, herbs and perfect for busy weeknights. Best of all, instructions to make these in the oven and the grill. Preheat grill to medium-high or oven to 450°F. Add the mushrooms, onions, and potatoes to a large bowl. Season with salt, black pepper then toss to coat well. Add the steak, olive oil, butter, garlic powder, thyme, and oregano to the bowl then toss to coat well. Cut four 18 x 12 inch squares of foil* and divide mixture evenly among each packet. Fold the foil over the steak and seal to close off the packets. Remove from heat and allow to stand for 10 minutes, to steam the potatoes. Sprinkle with fresh parsley and additional black pepper, if desired. Place foil packets on a baking sheet and cook for 18 minutes (rotating tray once). Open foil packets then return to oven and switch the setting to broil. Cook for an additional 2-3 minutes, or until steak is lightly charred. Remove baking sheet from oven. Seal the packets again and allow to stand for an additional 6-8 minutes so the potatoes continue to steam and cook. Sprinkle with fresh parsley and additional black pepper, if desired.